President Felipe Calderon visited the Sierra Chincua monarch butterfly reserve in the mountains of central Mexico on Sunday to announce his plan to enhance and publicize the reserve. Under the new program, the Calderon government will spend $4.6 million to buy additional equipment and advertising for the reserve, which is protected by Mexico and also internationally under the UNESCO Man and the Biosphere Program. "This nature reserve annually receives millions of butterflies that come to spend the winter in our ancient sacred firs after a journey of over 4,000 kilometers from Canada to Mexico," said President Calderon. For the Purepecha Indians, said Calderon, "the butterflies' stay meant the essence of the dead, because the butterflies used to arrive around the time of the Day of the Dead and for the Otomí and Mazahua, they represented the spirit of the harvest, because the harvest ended when the Monarch butterfly arrived." About $36.4 million in government funding already comes to the butterfly reserve each year to support a team of park rangers who attempt to protect the trees favored by the butterflies from armed groups of lumber thieves. The Mexican Fund for Nature Conservation and the World Wildlife Fund say these efforts have resulted in a 48 percent drop in illegal logging, compared to last year. "We're gaining ground in the fight against illegal logging," Calderon said. Monarch butterflies have one of the world's most unusual migration patterns. Every September, millions of the black-and-orange insects fly 3,400 miles from their breeding grounds in the forests of eastern Canada and parts of the eastern United States to the mountains of Mexico where they seek the same locations their forebears once inhabited. In late March, the monarchs return to U.S. and Canada where they breed up to five generations before heading back to Mexico. A typical butterfly will make just one migration during its lifetime. 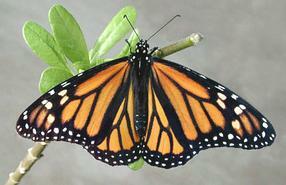 Some monarchs do not travel the entire migration route but reproduce and die along the way. Their offspring continue the flight. President Calderon announced Sunday that his government is working with the United Nations to have the monarch butterfly area recognized as a World Heritage Site, a result "which we hope to achieve soon," he said.